After many requests for another creative font bundle, we’ve done it again! This bundle includes 11 best-selling, hugely versatile creative font families. These fonts are not only beautiful, but include varying weights, styles, and even bonus packs to give you ultimate typographic control. Even better – every font includes web font versions AND extended licensing! After the huge success of our last creative font bundle, we set out to bring you guys something even more awesome. The 11 fonts in this deal are already best sellers, and among the best creative fonts in the world. Not only are they absolutely beautiful, but they include tons of extra weights, styles and bonus packs including symbol fonts/icons. The attention to detail in these fonts shines through, and they’re true works of art. Generally deals in this price range give you 1-2 fonts max. By including 11 fonts of this quality, we’re giving you quality and quantity, with unbeatable value. 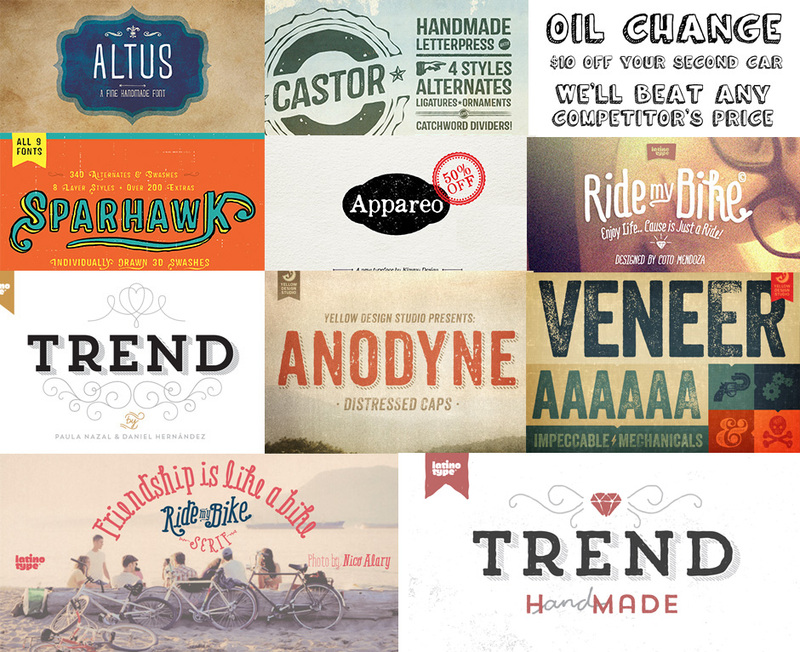 You’re saving 94% on this bundle, which is truly unprecedented for fonts of this quality. All fonts in this bundle include web versions, at absolutely no extra cost to you. These web versions would normally skyrocket the price, so to get them for free is pretty insane. So without further ado, on to the font goodness! Altus is a legible display family with both a sans-serif and serif version, as well as unique ornaments and extras. Altus is playfully hand drawn, but legible enough to be used as text. It works well with others, and has both uppercase and lowercase. The uppercase has a hint of a unicase flavor for a little extra playfulness. Opentype features include standard ligatures and discretionary ligatures. 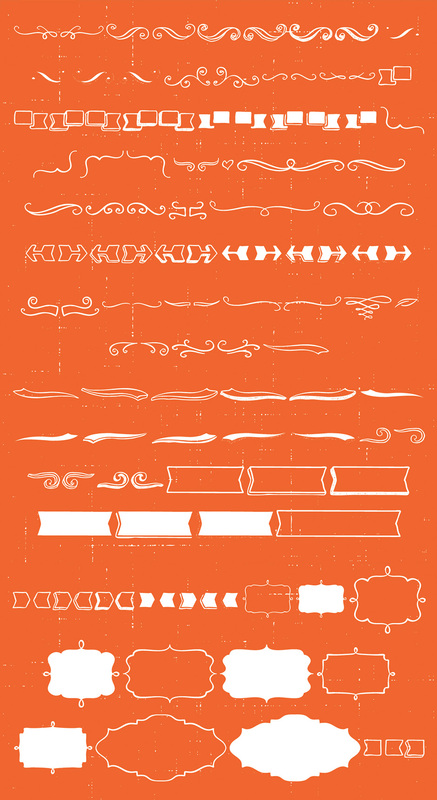 Altus also includes this great extras pack, containing lovely hand-drawn frames and flourishes. Castor is a wood type and letterpress hybrid based on grotesque letterforms. It’s a vintage distressed display with 3 options for each letter; Uppercase, lowercase, and alternates. 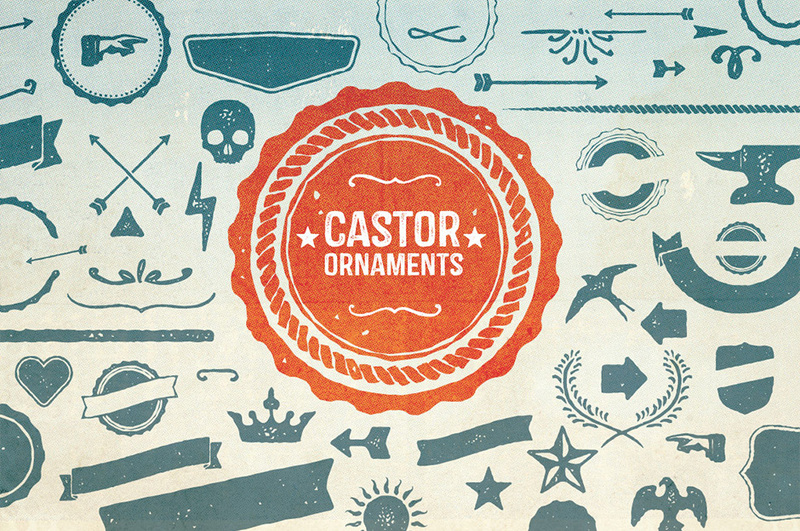 Castor comes complete with 4 styles plus catchwords, unique ‘catchword dividers’ (horizontal rules), ornaments, as well as a free set of extras! (grunge, dividers and bullets) The catchwords, ornaments, and dividers are designed to compliment the font family giving it a ton of diversity, and the designer unlimited creative options. Opentype features include alternate letters and numbers, double letter ligatures for realism, subscript numbers,and superscript numbers. 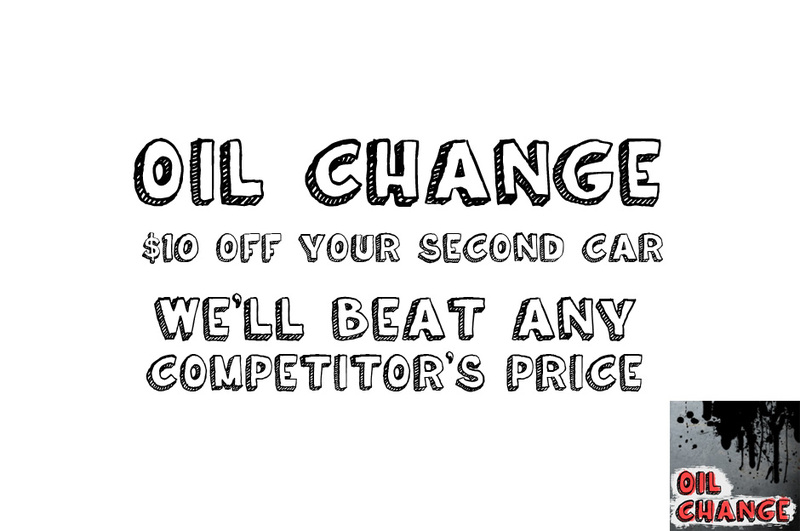 Oil Change is a hand drawn 3D display font with more personality than you can shake a stick at. It’s perfect for your more creative projects, and has a really personal feel to it. Sparhawk in it’s obvious form is a 3D layered display font, but its packed with over 300 swashes, extremely rare in the 3D font world. Every single swash is hand drawn for extreme realism. The lowercase are small caps and the swashes are designed to be used mostly with the lowercase letters (top and drop swashes), but the drop (bottom) swashes also work well with all caps. Sparhawk’s large character set and plethora of alternates makes it perfect for logo type, birthdays, weddings, bands… the list goes on. All features include: 8 Awesome Layer Styles, 15 sets of Stylistic Alternates (over 300+ Individually Drawn Swashes), Double-Letter Ligatures for upper and lowercase, and Contextual Alternates. This product includes all 9 fonts in OTF and TTF format. To fully give the authentic feel of worn pages of dusty of books, Appareo has 5 character variations assigned through Contextual Alternatives using Opentype features. This allows no two same letters to ever be found near each other. 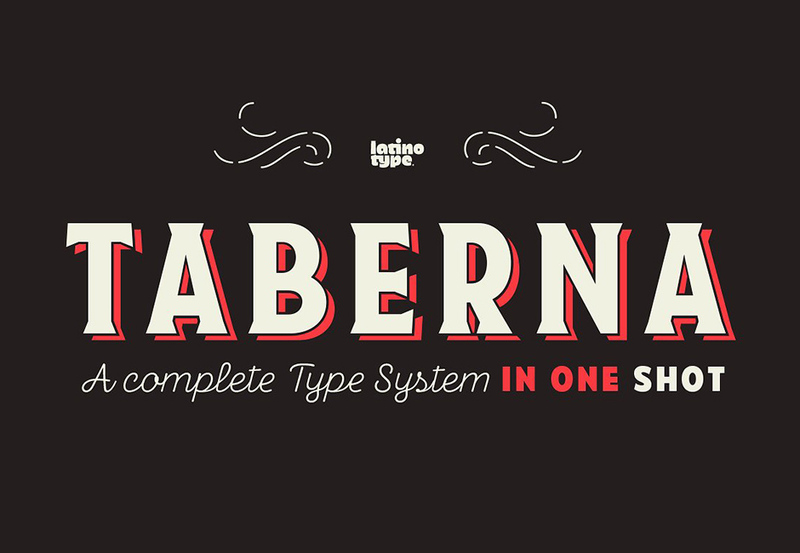 The Appareo font family is supported by a huge bonus graphics pack, containing a wide selection of frames and clipart. These graphics come in .png, .ai, .pdf and .eps formats. Ride my bike is a fresh handmade typeface inspired by street style and the new culture that moves pedaling around the city. Perfect for use in headlines, brands and fashion photography compose alternative, thanks to its leading characters, terminals, alternate characters and ligatures that you can find in the Pro version. This version contains more than 600 glyphs. The ‘Dingbats’ font in this family has 91 dingbats, very fun to compliment and accentuate the handmade design. If you do not want to ride so fast, you can find a version without OpenType features – Essential. 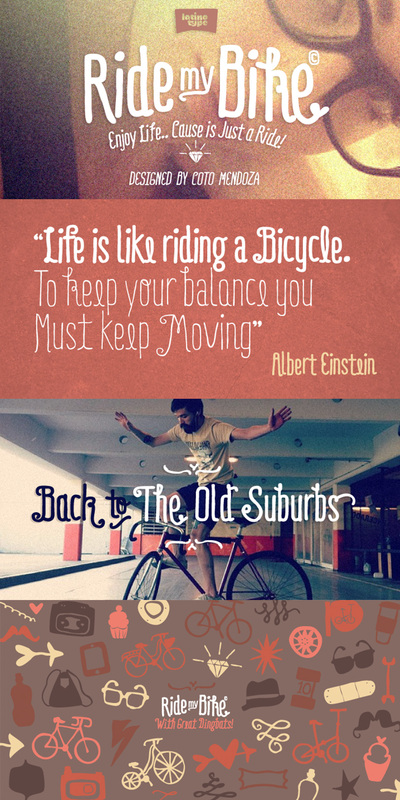 Ride my bike Serif is a new version of successful handmade typeface Ride My Bike designed by Coto Mendoza. Inspired by street style and the new culture that moves pedaling around the city. Perfect for use in headlines, brands and fashion photography compose alternative, thanks to its leading characters, terminals, alternate characters and ligatures that you can find in the Pro version. This time with serif. The ‘Ornaments’ font in this family has 121 dingbats, very fun to compliment and accentuate the handmade design. Trend is a font made of layers, taking as a basis a sans and a slab font. We’ve included all weights and variations, giving you the complete font family. It is the result of observation, search and study of the last global trends. Trend tries to capture the aesthetics of fashion or even fashion itself, integrating elements of a very popular and current trend. It is a typeface designed to be used without need to add anything external to it, because it has all components required for this. 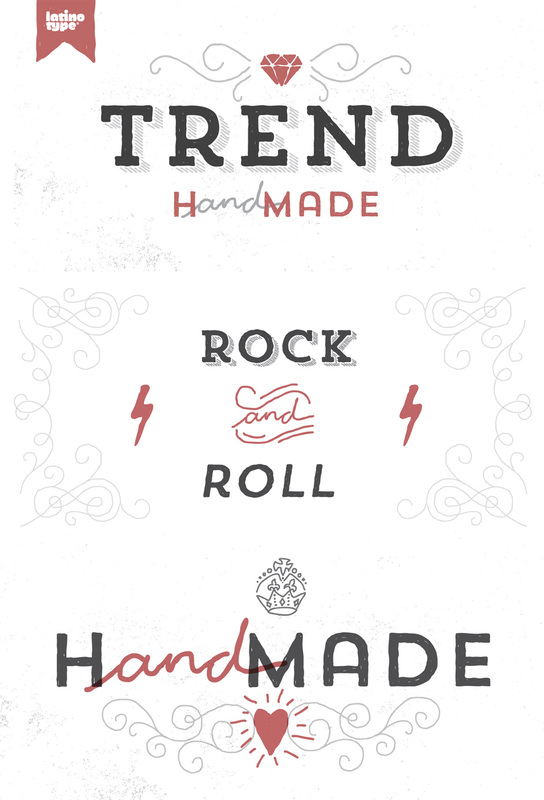 We’ve included the complete font family for Trend Hand-Made the more arty cousin of the regular Trend font family. This also includes varying weights and styles, and is absolutely beautiful to use in your more creative work! Veneer from Yellow Design Studio is a high resolution hand-crafted letterpress font that’s vintage and authentic with a touch of grunge. It’s highly customizable with six distress options for every letter and three for all other characters, and because it’s remarkably detailed, it looks great even at very large sizes. In addition it includes a matching set of funky extras! TIP: In Photoshop Veneer looks best with anti-aliasing set to “smooth”. Because of Veneer’s high level of detail, it may process more slowly in some applications. 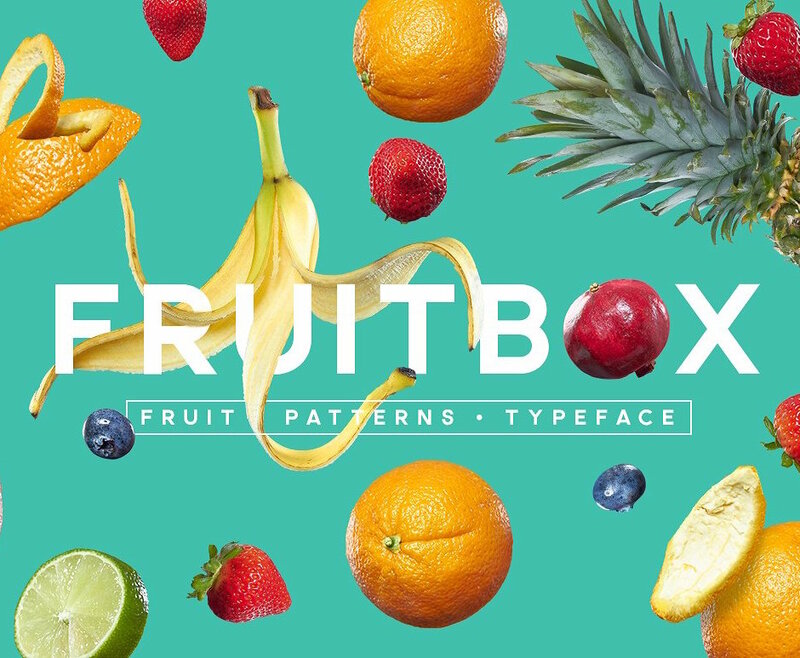 11 beautifully creative fonts, perfect for lending an artistic touch to your design work. Many fonts include varying weights and styles, giving you ultimate control. Many fonts include bonus/extras pack, containing symbol based fonts and additional icon packs. Deal includes 11 fonts. All fonts include web versions. I was purchasing then it showed as expired. Can I still get this? Thanks so much for your comment! 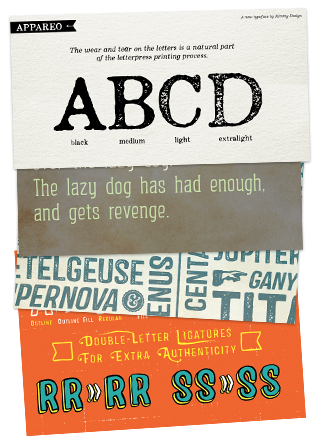 The Huge Creative Font Bundle is one of our much older bundles so it has been expired quite a while. Deal expired it shows , i’m also purchasing this, but it show expired .. But your guidance was amazing ..
it helps me alot . Thank you so much for getting back to Carol about this! I’m really sorry to be the bearer of bad news but I’m afraid this bundle is now well and truly finished and with our marketplace up and running, we will no longer be re-running our older deals. I apologise for any inconvenience caused, Luis, but please do let me know if there are any particular fonts in this bundle you were looking to work with and I will happily point you in the right direction to pick them up separately. Apologies again, Luis, but please don’t hesitate to contact me should you have any other questions. I’m here to help! Thanks For your Kind words Ben ! Nooooooooooooooo I missed it I missed it nooooooooooooooo. I’m so sorry you missed out on this. Unfortunately this bundle is now truly finished. This is actually a very old deal now, so it’s rather unlikely we’ll re-run this, as it’s already been offered several times. I’d recommend signing up to our free newsletter, so you’ll get updates on all our new bundles, and won’t have to miss out on our new font bundles. You can sign up on our main website: http://www.designcuts.com. If there is a particular font in this bundle that you’re interested in, I’d also be more than happy to send you a link to where you can purchase the font individually. Does Trend Handmade involved the full collection ? Hi, I’d also really appreciate it if I could be sent an email if you run this offer again. I already get updates (and am seriously debating the new font offer) but I love all these fonts so much I don’t want to miss out. Absolutely Eleasha, I’ll be sure to drop you an email if/when we re-run this deal. Thanks for all the support, and we hope you’ll enjoy our upcoming deals just as much. I’d also be interested to know if this bundle becomes available again, or anything similar! Hey Laura, we don’t have any plans to re-run this deal at the moment, but I’ll be sure to email you, if we decide to make it available again. In the meantime, did you get a chance to check out our current font bundle: https://www.designcuts.com/design-cuts-deals/the-inspirational-creative-font-collection-includes-web-fonts/, and the re-run: https://www.designcuts.com/design-cuts-deals/massive-artistic-font-bundle-includes-web-fonts/?product_id=27993? Damn i missed this deal. Would love to buy it now! Any Chance? You guys do a great job and offer nice stuff. Thanks. Hey Andreas,I’m afraid this bundle is now well and truly finished. We do however sometimes re-run an older deal as a bonus to a new one. If and when this deal is live again, I’ll be sure to drop you an email. I am obsessed with your font collections and hoping you’ll soon be offering another deal or bundle soon. Can you put me on your mailing list to be notified when you do? Do you think its possible to release a PDF displaying the fonts included in this bundle..? Took me a while to find the link to the page showing them. Hey Tony, I’m so sorry we don’t have a PDF guide for this bundle. We’ve started adding guides a couple of deals ago, due to a large number of requests for this. We may add guides to older deals as well, if time permits it, but it’s not 100%. The deal page should definitely be quite helpful though. Hi Tom, I only just discovered your site. Is there any chance of purchasing the fonts in this deal? I love them! Hey Jayne, I’m afraid the Huge Creative Font Bundle is now well and truly finished. We do however sometimes re-run some of our deals as bonus to a new one. I will get in touch with you as soon as this deal is live again. Yes, you need to. I was so busy I missed it! Please warn me too ! I would love buy this right now! Any chance of this deal being offered again? So disappointed I missed this! Have been looking at these exact fonts! Am guessing this is from ages ago, but is there any possibility of still getting the deal? I’m afraid this is now well and truly finished. But we do sometimes re-run older deals as a bonus with a new one. The best way to ensure that you don’t miss a deal is to join our free newsletter, by signing up at http://www.designcuts. Another fantastic deal. You guys are the best. You’re so welcome Marion, we hope you love using your new fonts. Please do let us know how you get on with them. if you love premium and well designed fonts, yes! You’re so welcome Oscar! Enjoy your new fonts :). Please let us know how you get on with using them. Did I miss the bus? The link I’m looking at says this deal still has 13 days left but when I click buy it puts the vintage pack in my cart. I already have that bundle so luckily it stopped me but is there anyway to still get ahold of this huge creative font bundle. It’s an amazing bundle! This is an amazing offer!! Can’t believe I missed out. I love all those fonts. How do I go about getting notified on when these type of deals come out? No worries at all Jay. I sent you an email about this. Hey Joe, I’m afraid the deal has expired (all our deals only run for 2 weeks each). I’m dropping you an email about this though. Hey Tom, any way I can get an email, I missed this amazing deal and would love any more info on if it will be possible to get it again. Hey Caleb, I’m emailing you now about this :). Gutted I missed this as I have a project that needs this deal! Will it be back on at all please? Schade – das wäre ein tolles “Osterei” gewesen, dass ich gerne früher gefunden hätte! I just bought the retro & vintage deal! What a steal. Too bad I missed this deal, I saw it last time but it was already over. Would there be any chance that it will return? Thanks for contacting us about this Charlotte. I’ve emailed you. I just discovered your website from my friend Preston (and former student) at GDB. So I bought your amazing texture deal! Wowza, I love it. Anyway, I am so sad I missed this deal on these beautiful fonts. Will you ever run this deal again? Thanks! Schade, das wäre echt ein toller Deal gewesen. Kein Problem, Susanne. 🙂 I’ve emailed you about this. Great!!! I did it again. I bought it. Thank you so much! Awesome stuff Susanne. We hope that you love using your new fonts. We’d love to see what you create with them if that’s ok? These fonts are so lovely its really a good deal. Thanks Andrea. I’m looking into this for you and will get back to you via email. That’s alright Greg. I’ve dropped you an email about this. Soooooo bummed I missed out on this! Would love to find out a way to purchase! Hey guys, any chance to extend as I also totally missed it… Thanks. No worries Vladimir. I’ve sent you an email about this. No problem Greg. I’ve sent you an email about this. Expired. Heart broken. Quick get me a tissue… I am about to cry… Bawwww haha. *sniff* how did I miss this?! No worries Bettie, I’ve dropped you an email about this. Any chance this deal may happen again? Not to worry about it, Liz. We’ve emailed you about this. Hello, just found you and signed up and somehow missed this great deal…any way to still get it yet today? Thanks! Hey Stephanie, thanks for commenting. I’ve emailed you about this. I’ve just bought this although i already got : anodyne, appareo (+web), trend hand-made and castor(+web). Webfonts are valid just for one website? We’re glad you were able to grab this deal at full discount Francesco. Just to confirm – you’re absolutely allowed to use the web fonts on more than one website. It’s just a restriction for one user (e.g. : you couldn’t share these with friends). I hope this helps. No problem, Rob. I’ve emailed you about this. A great start to the day, just got into the design studio and found this deal on my inbox from Red Lemon Club. Bonus! Thanks Matthew! We hope you love using all your new fonts. Please do let us see what you create using them. Fantastic stuff Tereza! I can’t wait to see how you put these to use. Hey Tony, thanks so much for the great review and feedback. We hope you love using your new fonts. Hello! Could you please check if they support spanish characters? They certainly do! Virtually all Western language characters are covered. Thanks for checking this with us Cesar. Hello! These fonts are beautiful! Such a great deal… I was trying to use the discretionary ligatures for the ride my bike font, but can’t seem to find how..
Hey Dayanna, thanks for letting us know. I’m emailing you about this now to help troubleshoot. We’ll get them working fine for you soon. I also bought Trend a month or two ago, but does this extended licensing cover apps?? Hey Alex, thanks for the kind words :). Trend is a wonderful font, and rightly very popular. The extended licensing definitely does cover apps. You may only not resell these fonts directly, or include them in products/programs where they are directly extractable. I hope this helps! Awesome stuff Adam! Thanks for commenting :). I’m sure these fonts will help you improve your site. Hey, how long is this deal going to be available? I would really really like to get it but i have to deposit a check first….. It expires on March 31st at midnight. I’m just dropping you an email about this Silas, I’d hate for you to miss out. We hope you’re loving your new purchase Fletch :). Amazing value! 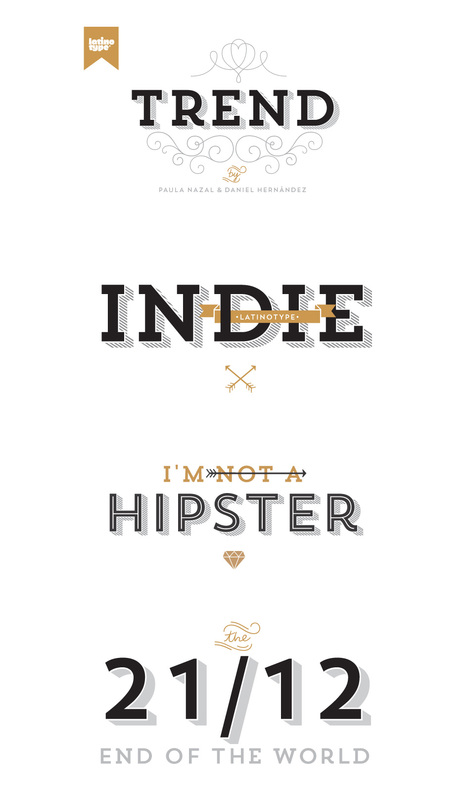 I’d be a fool not to buy these beautiful fonts. I’m so glad you guys were able to add Ride My Bike Serif too, thanks a bunch! Thanks Martha! We really appreciate the kind words. 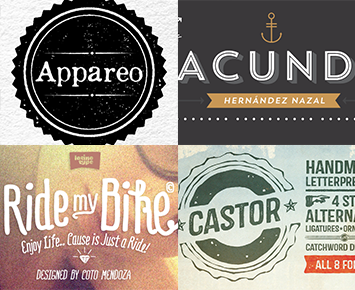 We were stoked to include Ride My Bike Serif, it’s such a lovely addition to the collection. We hope you’re enjoying using all your new fonts :). Do all of these fonts come with punctuation marks? I am pretty new to buying from here and am trying to use specifically Appareo for a school project but don’t want to spend my lunch money on something I may not be able to use. Please let me know! Hey Ceindy, great question. They certainly do. Not only this, but most of the fonts include tons of extra characters, glyphs etc… I hope this helps. Still being new into design biz and doing it on an ambitious hobby level, I spent the last few month visiting hundreds of tutorial and ressource websites in order to increase my knowledge and digital portfolio. Thanks to Spoongraphics I have found this great website, which totally blew me away. Like said, I visited lots of ressource sites therefore I am quite aware of the pricing of a good font and the rather restrictive licences most marketplaces offer. This makes it hard and expensive to grew a nice portfolio of digital items. With designcuts this totally changes. Saving 95% on this font deal is not only marketing bla bla – it’s a fact. Go and check out the regular prices of these premium fonts on other sites and you will instantly buy this deal like I did. Too bad, I missed the previous deal on vintage graphics – I hope I will get another chance one day – you guys simply rock. Therefore it’a a natural thing for me to rate this deal with 5 stars in order to recommend your deals to other people. Greetings from a really happy customer and best of luck for your further projects! Ah thanks so much Michael for the kind words and fantastic review. We’re so glad that you found us via Chris, he’s a good friend of ours here. Quality design resources are a brilliant way to improve your design work, and we’re so glad if we’re helping you on your design journey. I’m dropping you an email now, as I’d love to discuss your work further. I can’t resist! I buy them now! Enjoy Carme! We hope you’ll let us know how you get on with your new fonts. Heh, we’re no good at will power either when it comes to great design resources. We’re hope you’re feeling inspired to go and create some awesome new designs! Enjoy your new fonts Anna :). Does the sun rise every day? Is grass green? Should I grab this deal? This is a total no-brainer: of COURSE I should… and so I have, yay! (never mind if I already own a few of the fonts included—the whole deal itself is too awesome to pass up!). Thank you SO much for putting all these amazing fonts in one super-amazing package! Haha thanks so much for the kind words Liv. We hope you love using all your new fonts, and please let us know what you create with them. Thanks so much for the suggestion Fletch. The font looks really beautiful and we’ll definitely get in touch with Charles Borges de Oliveira to see if we can secure this font for a future deal. It really reminds me of silent film typography. I already owned a couple of these fonts, but the deal was so good that I couldn’t pass up the rest of them. And also having the full extended license and web-fonts is such a plus! Thanks Jared, we’re so glad you were able to grab this bundle at full discount. We hope that the other 9 fonts + extras made your purchase more than worth it. Amazing bundle. I really had no intention of buying it as I just bought fonts yesterday, but then with Trend Hand-made I could no longer resist! Thanks so much Nadine! We hope you’re loving your new fonts. Trend Hand-Made is one of our favourites from this collection too :). So I had this seemingly bright idea where I’d exercise a little self-control and not jump on this deal right away… memo to self… BAD IDEA. Today’s Lesson… 1) Chocolate and self-control do NOT belong in the same sentence ever and 2) neither do Design Cuts and self-control. Haha, best deal comment ever! We’re glad you were able to grab these fonts at the full discount Julie :). The question is – what are you planning to create using them? I had to find some way to entertain myself so I decided to see how many pieces I could muck up (mock up) in an hour using the fonts. I should mention that much of the time, the copy is changed so as not to fuss with NDA’s/clients in case you’re wondering why they don’t always make sense. Yeah, these rock Julie. Awesome work as always. :). I can’t believe we creative geeks made a feature in there too! That’s nuts that you were able to come up with so many designs in just 1 hour. Maybe boring meetings are secretly your inspiration? Thanks Mitch, we’re so glad you like it. Which 2 font families don’t you own? Sounds like you have a great font collection :). Thanks for this great deal! What fonts are included by Trend and Ride my Bike. The whole family or only a few fonts of it? I can’t find anything about this in your discription. Beautiful fonts! Does these fonts include skandinavian characters? Thanks so much Kristiina. I’m looking into this for you right now, and should have an answer soon. Good news! It looks like all fonts do have foreign language support, including a wide range of characters/ligatures. Did I fail to see this piece of information, or which languages do these fonts support? Hey Laura. I’ve checked with the designers involved and all fonts have foreign language support, covering most European languages. I hope this helps. Could you please check if they support Slovenian, Croatian, Serbian (Southeast Europe)? Checking this now for you, thanks for the comment Siniša.